For us California boys, going to the east coast in the winter is always a big deal. So we're always pumped up and full of courage (as much as we can muster, anyway) when it's time for PAX East in Boston! We're going back this year and stronger than ever. 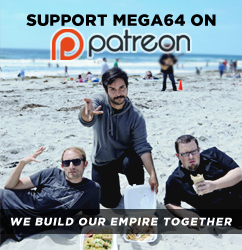 We have a booth the entire weekend (#22017) on the show floor, plus the Mega64 panel is on Saturday night at 8PM in Albatross Theater- don't miss it!